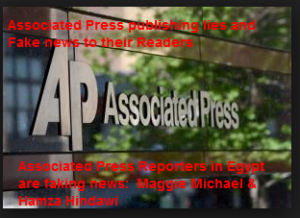 Blog Does Associated Press Pay Their Reporters In Egypt to Publish Fake News And Lies? Does Associated Press Pay Their Reporters In Egypt to Publish Fake News And Lies? You really don’t need to read the content of the article to find out what this is all about, because the title says it all! Reporters of Associated Press in Egypt started their first paragraph by claiming that the Extensive amendments of the constitution gives the Military more privileges, enshrining its place as the nation’s most powerful institution and the source of the real power, while removing parts that liberals feared set the stage for the creation of an Islamic State! My comment to this is, Hamza Hendawi and Maggie Michael haven’t really read a word in the constitution, or they were told to write what they have claimed and I’m going to prove my point here which will show that these two reporters are nothing but liars, and they are not doing their homework and they are lazy and they found it so easy to publish lies about the Egyptian Constitution, other than reading 247 articles in order to publish accurate news to their readers. Armed forces belong to the people, its mission to protect the country and preserve its security and territorial integrity, and the state alone creates these forces, and it is prohibited that any person or institution or group formations or create teams or military or paramilitary organizations. And the Armed forces have a higher council, as regulated by the law. Votes on the above article out of 50 members: 49 members agree, Approval: consensus. Is there any privileges or settings of powers in the above mentioned article? I want the Associated Press to respond to this question and if they they don’t it won’t make them honest by not responding, but it makes them Big fat liars and spreading fake news to their readers, probably they are having financial problems and faking news is the way to get the financial status a little bit better. The Minister of Defense is the Commander in Chief of the Armed Forces, appointed among its officers. Votes on this article out of 50 members: 47 votes agree – Abstention: 1 – objection: 1. What is wrong with the above mentioned article? I guess the reporters of Associated press, the faking news reporters are objecting this article because perhaps the Commander in Chief of the Armed Forces should be appointed by the Egyptian belly dancers Union! Or who? Maybe he should be appointed by Mommy America? Is there any privileges in the above mentioned article? Associated Press you are responsible in front of the Egyptian Public Opinion of what your reporters in Egypt are publishing. If they fake news and mislead readers and the International Public opinion, your readers are not going to say that Associated Press reporters are LIARS, but they will say Associated Press News Agency doesn’t have any credibility in what they publish, not only about Egypt but in general because they don’t publish anything but lies and fake news. In addition Associated Press is not following nor respecting the Press Ethics. It means Associated Press doesn’t have Honor nor morals. That what it means to Egyptians at least. The law regulates the general mobilization, and shows the conditions of service, promotion, retirement in the Armed forces. The competent judicial committees for officers and individuals of the armed forces, but not others, to adjudicate all administrative disputes which concern the decisions issued in their regards, and the law regulates the rules and procedures of appeal against the decisions of these committees. Can anyone out there point at any privileges in the above mentioned article? Who should handle the Administrative disputes which concern the Military Individuals? The American Congress or the Associated Press Reporters? I need a response and answers from the Associated Press. Don’t you guys realize that Egypt can sue the Associated Press for publishing lies and fake News? The National Defense Council is created by the President of the Republic, the membership of the Prime Minister,the President of the House of Representatives, the Ministers of: defense, foreign affairs, finance, interior, and the head of the General Intelligence Service , and the Chief of Staff of the Armed Forces, and the leaders of the Navy, and the Air Defense, and the chief of operations for armed troops and the director of military intelligence. Given specializes in private affairs means to secure the country, and safety, and to discuss the budget of the armed forces, and included a number one in the state budget, and the Council’s opinion is taken in the draft laws relating to the armed forces. The law defines other specialties of the council. When discussing the budget, it includes the chief of financial affairs of the armed forces, head of the Plan and Budget Committees and Defense and National Security Council Representatives in the Egyptian Parliament. The President of the Republic calls who he sees among specialists and experts to attend the meeting of the council without having a countable vote. What are the privileges for the Armed forces in the above mentioned article? Who should create the National Defense council? China or England? who should be in this council to discuss all national security matters, including the Military budget? Obama Bin Lying? I need an answer to this one too, Associated Press faking news about the Egyptian Constitution. Military Judiciary is independent judiciary, Specialized without the others, to look into all crimes related to the Armed Forces, and its officers and personnel, and the like, and crimes committed by members of the General Intelligence while or due to the Intelligence service. It is Prohibited to trial any civilian in front of the Military Judiciary, except in the crimes that represent a direct assault on military establishments or camps of the armed forces or the like, or military areas or planned borders as well, or military equipment or vehicles or weapons or ammunition, or documents or military secrets or military public funds public or military factories, or crimes related to recruitment, or crimes that represent a direct assault against its officers or its individuals due to performing their jobs . The law defines such crimes, and shows other references of military judiciary. And members of the Military Judiciary are independent can not be dismissed, and they may have all the guarantees, rights and decided duties of members of the judiciary Authority. I underlined the sentence which is saying that no civilian will be trialed in front of Military Judiciary, which have stopped all arguments about this article. If you are a civilian and you are not going to attack or commit any terror attacks against military individuals or camps or military establishments, why would you fear or object this article? If you will attack the Military or their establishments then you are a criminal and a terrorist and you will be punished by the law. Just like if you are a peaceful protester and you are not going to attack or burn any private or public properties or expose the safety of others to danger, why would you fear the protest law which organizes protests, unless you intend to commit violent acts?! The members of the Fifty’s committee agreed on this article with 41 votes meaning Consensus, isn’t this the Democracy that US are claiming that they defend it? I deliberately added the numbers of votes and the objections to show the percentage of voting of the majority of the Committee who represented the people in Egypt in this constitution. I need to ask here, who can handle any crime committed against the Military in any country in this whole world? I guess Associated Press can tell us who!? This article in the constitution is very clear and very specific. Associated Press is not just publishing lies, but they are also predicting! Reporters in their article were claiming that this article is still vague and can give military more power in the future and still expose civilians to Military trials! So you guys are representing Egyptians now? How come we haven’t seen you including the 50’s Committee? Is it the Traffic still?! You just represent yourself and Egyptians do not ask liars to represent them. Are you guys reporters of Associated Press or Associated Press Fortune tellers? Maggie and Hamza also claimed that the constitution reduced the authorities of the President! I guess Both reporters were ok. when Morsi the former President had all executive and legislative authorities in his hands and was acting above all laws! Mentioning the President authorities that both reporters obviously haven’t read anything about it, the President Authorities starts at Chapter 2 the Executive Authority Branch one the President of the Republic starting from article 139 and ends with article 183. In case the reporters of Associated Press don’t know and lost their way in the Constitution. Associated Press claimed that the Military took privileges and more power means that Associated Press is accusing directly all the 50 members of the Committee who worked on this constitution amendment? I wonder why!? By claiming that the Army took privileges in this constitution, Associated Press is accusing the 50 members representative of the Egyptian People of corruption or maybe bribes to give the military privileges, and that’s their accusations to the 50 members committee. When News Agencies publish lies and mislead their readers, they leave them to imagine and get the impression of whatever they like based on the basic lies they have published whether in the title of the article or the content of the article itself. The committee who worked in amending the constitution gathered all members from different currents who represent the Egyptian People, including Youth and Tamarud (Rebel campaign of 30/6/2013 Revolution) and other revolutionaries representatives and Islamist and Christians and handicapped representatives and women representatives…etc. Maggie Michael and Hamza Hindawi are accusing all these of corruption! The following Video shows the Committee of the 50 after they were done from the Constitution draft, they were standing to salute the Egyptian Flag. Look to the representative of handicapped, when he stood up despite his disability and he couldn’t stop his tears for the first time in his life he sees handicapped have a representative in the constitution, and for the first time, handicapped have articles in the Constitution to protect their rights because they deserve the best and they deserve respect. Does this guy looks like he has taken bribes or he is corrupted! Long Live Egypt, that’s what they chanted. The contradictory in this article which doesn’t make any sense, that both reporters claimed the privileges of Military and the liberals fear that this constitution set the stage for creating an Islamic State, meantime they mentioned that this constitution is better than the Brotherhood one because it contains freedom and human rights and political rights articles. I really didn’t get it! what the privileges of military have to do with liberals fears and the comparison between both constitution of 2012 and 2013? It’s still proves that they haven’t read a single article in the 2013 constitution! And that’s why I worked on translating all the 247 articles of the constitution to English and I’m going to publish it very soon just to say one message to all those who are publishing lies about Egypt, and to those who are trying their best to take us 10 steps backwards every time we take a single step forward and they claim lies about the new constitution that really represents the 30th of June 2013 Revolution, and I wonder why?!!! So, if these two reporters claimed that this constitution is the formation of Islamic nation, I wonder what do they think about Brotherhood Constitution of 2012? Are all the 50 members who are from different currents and represent Egyptians, are stupid and retarded or corrupted when they voted with majority on all articles after they discussed them and amended them?! And only Associated Press speaks about future fears!? How come Associated brilliant reporters in Egypt, haven’t done one single report with different categories and classes in Egypt to really publish what do Egyptian think about the new constitution? Instead, they made a single interview with one guy saying that he was the key of 25th revolution, and what he said matches with their lies! Does this unknown key person represents Egyptians now, so Associated Press based their articles on his claims?! They also formed these big lies of theirs on the opinion of unknown rights experts who according to the reporters fear that political power carved out for the Military and could leave these rights irrelevant. They haven’t mentioned to us who these rights experts are or even brought any poor single proof on what they claimed. Like, they should have published the articles of the constitution and discussed them and showed us in which articles are these fears located. I don’t think the reporters of the Associated Press have read the whole 247 articles of the constitution, because if they did, they would have not published lies about it. Then they wrote the following which proves what I said that they have n’t read a thing in this constitution and not even the following article they have argued about. Probably they heard about it while they were sitting drinking coffee or tea with their Friends! They even didn’t bother to add the number of the article above. And it was not written like they have claimed. Article (146) When the government is assigned by the political party or the Coalition which gained the majority of seats in the Parliament, The President of the Republic has the right to consult with the Prime Minister, to choose the ministers of defense, interior, foreign affairs and justice. So Ms Maggie and Mr. Hamza reporters of Associated Press, did you guys now find out who assign the Egyptian Minister of Defense? Or you don’t? Do you want me to sing it for you, so you pay attention next time before you publish lies? They also wrote with their own hands what confirms that they are liars and haven’t read the constitution and the President Authorities articles. They wrote that it leaves the power of the president uncertain. Maybe now these two reporters are going to read the 247 articles to check who is what? Or why bother, it’s easier and faster to write a report or an article full of lies. The military representatives in the Committee of the fifty who amended the constitution, he was representing the Military and no one else from the Egyptian People because the rest were representing Egyptians. And the Military representative did not interfere in any other articles that doesn’t concern the military because there were total 50 members and they discussed all issues as a committee and not one representative forcing articles on others. So why these reporters published lies and false news about not just the Military but also they accused the committee of the constitution of corruption. This is really a serious accusations and Egypt have the right to sue Associated Press and their reporters. Another thing, both reporters wrote that the Military enjoys the right of choosing his Minister of Defense, and this is taking away this Egyptian people’s right in choosing their Minister of Defense?! Really, is that so?! So let’s make a referendum then about who the people would like to have as a minister of defense. Does he need to be from the Armed forces or not necessarily? I guess according to Associated Press, no not necessarily. Perhaps we can assign Steven Seagal or no he is getting too old now, or maybe Baby Bash, what do you think? He can also have a Plumber background or a bus driver background, after all we are just talking here about the assignment of The Minister of Defense The Chief Commander of Egypt, no big deal! Then both reporters based all their claims on a single opinion by Hossam El-Hamalawy and they described him as a leading member of the revolutionary socialists movement and a key player in the 2011 uprising of Jan 25! Hossam El-Hamalawy maybe was a key player in the 25th of Jan 2011, but he isn’t anymore, is he? How come reporters did not interview the key players of the 30th of June revolution? They couldn’t of course, because I don’t think the key players of 30/6/2013 who participated in the committee of 50’s would say what these reporters want to write about. Do you know who is the key player in Egypt now? More than 37 million Egyptian who overthrew the Muslim Brotherhood Fascist Regime. The Egyptian People are not just the main key player on the real ground, but they are also the one and only key player in Egypt, put this in mind and don’t you ever forget it reporters of Associated Press faking news about any progress Egypt is trying to achieve. We are the source of Authority in Egypt, not Associated Press or their reporters and surely not Hossam El-Hamalawy, Associated Press Key player of lies and false news! Of course both reporters did not forget to mention Brotherhood supporters killed by the Military and security forces and of course they did not forget to mention that there are 10,000 civilians are believed hauled before military tribunals for 17 month after Mubarak Ouster. And of course they haven’t publish any names or any evidences to prove their claims about all the Islamist killed by Military or the thousands trialed under Military Judiciary! Give us some proofs, just a single one, one poor list of killed Islamist by the Military that reporters of Associated Press have seen with their own eyes or at least to show us proof that they have, that the Military killed these people they claimed of accusing. Do you guys ever follow on any case trial in Egypt? Did you guys publish the final autopsy report of who got killed and how after the Disengagement of Brotherhood Sit-In? Show us any proof that there are 10,000 civilians were trialed under judiciary courts after Mubarak stepped down, so we can clap for you and say Hurray! Associated press is telling the truth for just one time! Before you talk about the Military vast economic empire and accuse them of corruption and serious crimes, I invite you guys to go and pay a visit to the Military different and many projects on the real ground and see what the Military did and still doing in participating to get the country on its feet and how they are providing many products with cheap prices and services in all fields and sectors which are serving Egyptian People. Perhaps you need to check whether the Military is a burden on Egypt or is it our Problems are mountains of crisis the Military is carrying on their shoulders! And they are also paying from their blood and own lives daily, getting killed by Terrorists. If the Military have an economic empire, the whole Military institution belongs to Egyptians and the Military is not a trader or a merchant. Perhaps you guys haven’t learned the difference between criticizing and insulting and shooting false accusations, and I wonder why? Maggie and Hamza reporters of Associated Press are Egyptians, which is ok. But what’s not ok. is that they are publishing lies. I really wonder if they have suffered like us from Muslim Brotherhood Regime? Or if they have criticized Brotherhood Regime the same way they are shooting accusations against the Egyptian Military and a whole country and people who are fighting Terrorism and die every minute whenever our kids go to their schools and we are worried to death if there will be any terror attacks against our children today or they will come back home safely. Maggie Michael and Hamza Hindawi, Associated Press, SHAME ON YOU!